In recent years, Nghe An province has continuously improved the business environment, diversified promotion activities and thus successfully attracted more investors. The Spring Investors Meeting, a unique initiative of Nghe An province, has become a fine tradition that strengthens the bond between the government and businesses. Prior to the meeting in 2018, the Vietnam Business Forum Magazine has an interview with Mr Nguyen Xuan Duong, Chairman of Nghe An Provincial People’s Committee. Ngo Khuyen reports. Could you share some remarkable socioeconomic development outcomes in 2017 and key tasks of Nghe An province in 2018? In the face of enormous difficulties in 2017, with the care and support of central authorities and the effort of the entire political system, the business community and the people, Nghe An province achieved many important results: Completing or exceeding all 27 planned targets. The gross regional domestic product (GRDP) reached VND75,813 billion, up 8.25 per cent over 2016 - the highest growth in four years (7.13 per cent in 2014; 6.81 per cent in 2015; and 7.22 per cent in 2016). The per capita GRDP was VND32.26 million. The budget revenue amounted to VND12,030 billion, up 9.3 per cent. Remarkably in agricultural production, the restructuring process was sped up to form larger specialised farming areas to apply new management models and technical advances obtain high economic value. The province also closely directed loan disbursement for fishermen who live on offshore commercial fishing, pressed on the construction progress and reduced outstanding debts in rural basic infrastructure construction. The national target programme for new rural development was broadly carried out. Up to 174 communes and three district-level units (Thai Hoa Town, Vinh City and Nam Dan District) completed new countryside construction. The industry and construction sector regained high growth momentum, ending the year with a 13.5 per cent growth. In industry, 17 out of 36 key industrial products reached planned outputs, with eight high performers boosting the overall industrial growth. Many key projects were put into operation, including National Highway 7 that connects to Nghi Thiet, Song Lam cement grinding station, Vinpearl Cua Hoi Resort and Villas, and The Vissai Port whose operations will open up new economic growth prospects for the province. Services, trade, tourism, information and communication, transportation, finance and banking generally prospered. The export turnover reached US$808 million in the year, up 20.11 per cent year on year, while the import value was US$483.9 million, up 24.62 per cent. Tourist arrivals totalled 3.9 million, up 21 per cent on year, of which 80,000 were international visitors. Tourism revenue reached VND5,890 billion, up 27 per cent over 2016. The province focused on attracting investors into its strong industries. It licensed 175 new projects valued VND15,000 billion. The social and cultural sector continued to have many achievements, with social security guaranteed, 83.5 per cent of families certified cultured, and 37,590 new jobs created. In 2018, Nghe An province will review the implementation of Resolution 26/NQ-TW of the Politburo, carry out the master plan for socioeconomic development to 2030, with a view to 2050, build Vinh - Cua Lo Road, and continue with the Vinh urbanisation sub-project. In Nam Dan district, apart from Vingroup Joint Stock Company which is executing some projects, the district will also carry out the construction plan to 2035 where Nam Dan Town will be enlarged. In Nam Ha district, the ongoing Hemaraj project is expected to open new economic prospects. 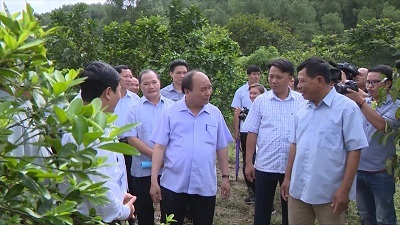 Many high-tech agriculture projects in Nghia Dan invested by TH Group has also brought a new vitality to the economic picture of the province. On June 7, 2017, the Nghe An Provincial People’s Committee issued Directive 08/CT-UBND on stronger solutions to better administrative reform in Nghe An province, where the role of public officials and employees and the responsibility of heads of State bodies are stressed. Could you please tell more about this? Over the past years, public administration reform has achieved remarkable results but still saw some shortcomings such as the low responsibility of heads of some State bodies; insufficient competence and weak professional ethics of some officials and civil servants in performing their duties; inadequate facilities, and unstable performance on the Provincial Competitiveness Index (PCI), the Provincial Governance and Public Administration Performance Index (PAPI), and the Public Administration Reform Index (PAR INDEX). Particularly, the PAR INDEX ranked 38th out of 63 provinces and cities in 2016, a drop of 17 places from the 2015 rankings. To address existing shortcomings, the province has adopted many solutions and activities pressed on directions and supervision. For example, on June 7, 2017, the Provincial People’s Committee promulgated Directive 08/CT-UBND on stronger solutions to better public administration reform in Nghe An province. The directive identified some shortcomings in public administration reform and demanded provincial departments, branches and district-level governments to review their functions and tasks and base on general criteria and component criteria of the PAR INDEX of the Ministry of Home Affairs to focus on effective solutions. The key tasks are strengthening the direction, administration, inspection, monitoring and evaluation of performances; diversifying forms of communications on public administration reform; implementing and directing to bring all administrative procedures to right authorities at all levels where the one-place single-window mechanism is applied. To carry out the above contents, the Provincial People’s Committee has assigned each and every department, branch and unit to perform their specific tasks as follows. The Department of Home Affairs is responsible for urging provincial departments, branches and localities to develop their tasking projects; reviewing, appraising and submitting the public employee structure and the public employee title structure to competent authorities for approval and deployment; advising the Provincial People’s Committee to direct districts and towns to review and implement solutions to standardise commune-level officials and civil servants. The Department of Justice shall advise the Provincial People’s Committee to make legal documents according to schedule and right process; formulate and implement plans and reports on law enforcement observance according to the defined time and regulations; and carry out plans of reviewing and appraising administrative procedures. The Department of Finance responsibly advises the Provincial People’s Committee on effectively managing and implementing self-financing mechanisms in administrative agencies, financing public administration reform, and deploying the one-place single-window mechanism across administrative units. The Department of Information and Communications will advise on the full, right and effective implementation of assigned tasks on administrative modernisation and submit to the Provincial People’s Committee to issue the plan for information technology application. With decisive directions, Nghe An province will make strong changes in personnel towards qualified, responsible, devoted, dedicated, dynamic and creative State employees, especially leaders of important branches and fields. It will strongly focus on building an administration that serves and supports the business. In addition, the province will underline the responsibility of heads of State bodies in administrative procedure reform, publicise processes and official responsibility for handling administrative procedures, intensify inspections into official duty performances and resolutely handle officials or public employees who commit violations or cause trouble for people and enterprises. At the same time, Nghe An established and publicised telephone hotlines and online websites to directly receive comments and feedback, and supply answers for businesses. The Spring Investors Meeting is a unique initiative of Nghe An province. How do you assess the significance of this fine tradition and results achieved after nine gatherings? After nine investors meetings held at the start of the year, Nghe An province has gradually improved the quality of investment environment, associated enterprises and investors, particularly big ones, to tackle their hardships for joint cooperation and sustainable development. After nine years associating with the Bank for Investment and Development of Vietnam (BIDV) to host the investors meetings (since 2009), Nghe An province has attracted 804 investment projects with more than VND261 trillion (over US$10 billion) of registered investment capital, including 758 domestic investment projects with over VND101 trillion and 46 foreign direct investment (FDI) projects with more than VND160 trillion. In particular, many large-scale and advanced projects have come into effective operation, created many jobs and paid a lot to the State budget, for example, TH - True Milk dairy projects, Sai Gon - Song Lam Brewery, Hanoi - Nghe An Brewery, Sabeco Packaging Company, Ban Ve Hydropower Plant, Hua Na Hydropower Plant, MDF Wood Factory, two Hoa Sen Steel Mills, Song Lam 1 Cement Plant, Song Lam 2 Cement Plant, animal feed factories, cow breeding farms and beef factories, Northern Masan Food Centre, garment factories, electronic parts suppliers for South Korean and Japanese investors, more than 10 hotels owned by Muong Thanh Group, and especially, VSIP Nghe An Industrial, Urban and Service Area and Hemaraj Industrial and Residential Zone. In addition, many important infrastructure projects such as airports, seaports, traffic routes, power grid, water and telecommunications networks have been upgraded to support investors to carry out their projects in the best manner. On the occasion of the 10th investors meeting, do you have any message or commitment of the provincial government to convey to partners and investors of the province? From achieved results and practical leadership, we are aware that we must “strongly improve the investment environment in order to attract more domestic and foreign investors, focus on developing some industries with high scientific and technological content and added value, develop supporting industries, clean, energy-saving and environment-friendly industries” for rapid and sustainable development. Therefore, supporting enterprises and investors to seek investment opportunities and operate effectively has become an important political task of Nghe An province, and it is carried out together with nine measures deployed to improve the investment environment. With the desire of turning Nghe An into an effective investment destination, we have been ameliorating the investment and business climate, creating favourable conditions for enterprises as guided by the Government and the Prime Minister. 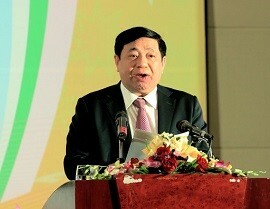 Hence, at this conference, we expect to receive more comments from delegates in order to make Nghe An province a centre of finance, trade, tourism, education - training, science - technology, health, culture, sports and high-tech industries in the North Central Region, as defined in the Resolution 26 of the Politburo.